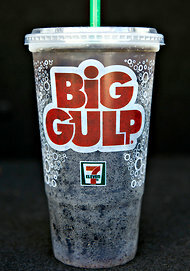 Big Gulp: American symbol of freedom? New York City, which has over the last few years become the center of public health policy (they were the first to ban added trans fat and to start labeling menus with calorie and fat content), is proposing a ban on giant sodas. Public health officials emphasize that consuming large quantities of sugary beverages contributes significantly to obesity, and that large cups contribute to higher consumption. This is correct. The beverage industry is carrying on like it’s the end of freedom and capitalism as we know it, as the purveyors of foods with added trans fat and higher calories carried on before them as they faced public health legislation. Regulating public health can impact the ability to turn a profit, but only if businesses refuse to change their business model. The Double Fudge donut has 130 calories and 7 grams of fat — about the same as a cookie. Woo-hoo! 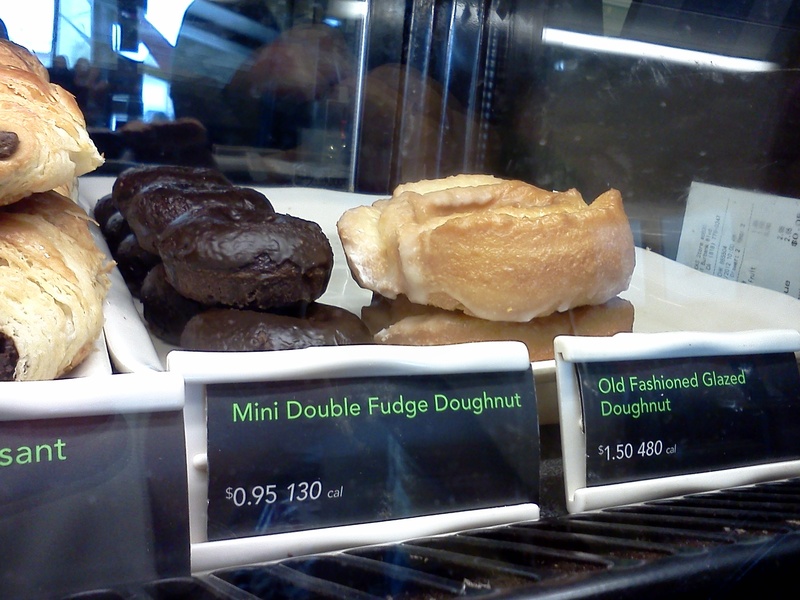 Starbucks, for example, faced new menu regulations last year requiring them to disclose the calorie and fat content of each bakery product in their prominently displayed cases. The bakery case entices while the beverage-seeker awaits, but a blueberry scone becomes a harder sale with a tag warning the consumer that it’s a 460 calorie indulgence. Their solution? The words mini and petite. Little doughnut, fewer calories. Little scone, fewer calories. They also introduced oatmeal with optional toppings, and released a pamphlet highlighting the food offerings under 350 calories. It seems to be going all right: in June, Starbucks acquired LaBoulange Bakery to continue to increase its bakery offerings while keeping a bigger piece of the pie, so to speak. Sugary drink aficionados, just know that when you fill up the cup, you are likely to drink what is inside rather than water, whether the cup is 8 oz. or 64 oz. Cutting back here is an excellent way to lose weight, it’s true. Cutting back on your insulin spikes is an excellent way to prevent diabetes and heart disease as well. But if you’re worried about losing your freedom, you can rest easy knowing that 7-Eleven will still be allowed to sell its 1.3 L Big Gulp (Double Gulp?) because grocery and convenience stores are exempt from the ban. You can also buy two sodas at the restaurant if you insist, but judging by the amount of money soda makers are using to fight this, you probably won’t. If the ban passes, you should look for some changes. Beverage makers will come up with healthier solutions, perhaps sold in bottles on the side. The American capitalist spirit never dies, it merely reinvents itself to better suit the needs of its consumers. How can I tell if a fruit or vegetable is organic, or has GMOs? A woman asked me this as she gazed at my bag of pears a couple of weeks ago. You can tell by looking at the PLU or Product Look-Up code on that sticker with the Kung-fu grip. Look for a 4 digit number beginning with the number 3 or 4 if the variety was grown conventionally, and the same number with a 9 in front of it if the variety was grown organically. For example, the PLU code for a banana is 4011, and an organic one is 94011. Because it’s voluntary, you never really see it, but if the code begins with an 8, it means it’s genetically modified. Organically-grown produce cannot be genetically modified so if the prospect of GMOs in your food keeps you up at night, go organic. 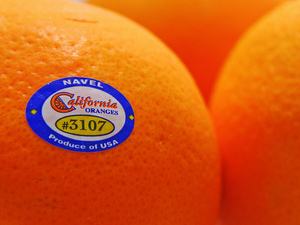 Those absurdly sticky stickers are good for another thing: Spotting the country where the produce was grown. If the produce was grown half a world away, it’s an indication that you are eating something that is out of season in your part of the world. On the other hand, if you are consuming something that came from closer to home, you will likely pay less for it, and it will likely taste better too, because it will have been picked closer to being ripe. Now go peel off the stupid things and get eating! Oh, Oh, I know! Pick me! Pick me!! Does this look like a cup of blueberries or a tomato? They might be all right, but usually they don’t taste as good as their fattier, more deliciously made, unfortified cousins. Blueberries, tomatoes, and most of the naturally high sources of vitamins and minerals contain fiber as well, but as important, they contain important phytochemicals (phyto: plant) that work together in ways we don’t yet fully understand to promote health. 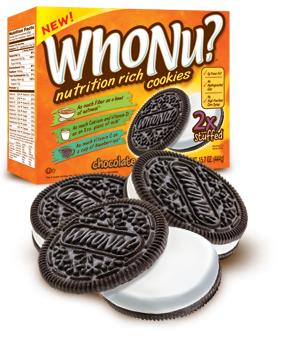 It’s not the WhoNu (can we NOT SPELL?!) cookies that bother me as much as what you won’t be eating when you consume too many of them. The FAQ on WhoNu’s web site suggests they might know a bit about this, as there is a caution about getting used to eating more fiber. Two cookies contain 3 grams of fiber, and you need 25 (women)-38 (men) grams of fiber a day. Three grams, or one serving, isn’t going to send you running to the bathroom but a heap of these cookies to the uninitiated colon sure will. Also, and it doesn’t promote this as a health claim on the label, but many of their cookies are a “good” source of saturated fat. You know, the stuff that raises cholesterol levels, clogs your arteries and kills ya? Blueberries and tomatoes, carrots and their juice, oatmeal and spinach don’t have any of that. Who knew?